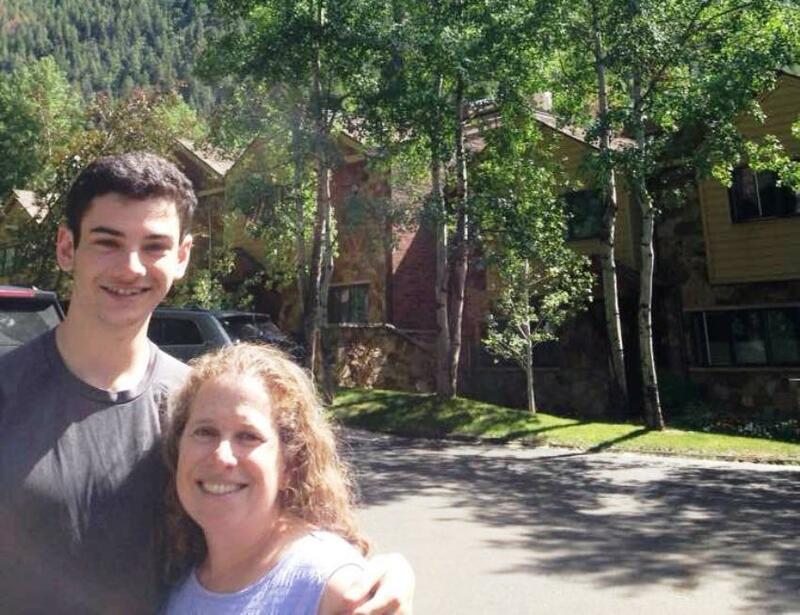 Nancy Shohet West and her son, Tim, arrive at their destination: Aspen, Colo.
Every summer of my childhood, my family drove cross-country from Massachusetts to Colorado and back. It was the 1970s. Chilled cans of Coke were a daily treat; my sisters and I passed the time reading back issues of Seventeen magazine; and at least one of us was usually sprawled, un-seatbelted, in the station wagon’s rear storage area. But despite my parents’ admirable efforts to stud the itinerary with stops at national landmarks, museums, colorful small towns, and college campuses, I saw the five-day journey as a tedious necessity, the price to pay for the far more desirable reward: a month at my grandparents’ Colorado ranch with my cousins and other family members. I didn’t mean by myself, of course. Nor did I mean with my family of four. I meant my 19-year-old son Tim and me. My parents were grateful; my son, 400 miles away at college when I made this announcement, heard about it as an edict and not a request. And so in late June, the two of us – Tim at the wheel, me with mapping software and an app for finding last-minute hotel deals – hit the highway, westbound. Unlike my parents, I did not strive to fill our itinerary with cultural highlights or educational opportunities. We had limited vacation time, and Tim already had seen much of the same countryside on college visits a few years ago. But despite my general lack of sentimentality for the cross-country drives of my childhood, as we passed through New York and entered the Midwestern states I hadn’t seen up close in over 30 years, nostalgia crept in. Immersed once again in these roadside landscapes, I remembered the mesmerizing sight of cornfields undulating to the horizon; the soft, humid, midsummer heat of the Central Plains; the primal sense of accomplishment that comes from watching the highway unspool in a straight line leading from one state to the next. Friends predicted that all those hours would foster heart-to-heart discussions between my son and me, as driving with teenagers sometimes does. But it wasn’t really like that. Instead, we passed a lot of time in companionable near-silence, remarking only sporadically on the farmland we were passing, the work of long-haul truckers, the current functionality of the Erie Canal. One thing my son and I always have had in common is companionable silence, dating back to his days in the jog-stroller while I ran. I’d witness other parents dispensing a continuous stream of commentary intended to provoke their offspring’s intellectual growth; but for us, quiet contemplation of our surroundings was always our default mode. My instincts in recruiting him as a travel partner turned out to be on target. It wasn’t just his attraction to driving, such that he took the wheel for about nine or 10 of our daily 12 hours on the road. It was also his typical teenage fearlessness, which meant when we got caught in a three-hour monsoon in Iowa, he not only navigated us confidently through the downpour but also amused me by singing operatic versions of “Under the Sea.” Another reason teenage boys are good for road trips: they tend not to be fussy eaters. Whether we stopped at a service plaza in Indiana, a farmers’ diner in Nebraska, or a fruit stand in upstate New York, he agreeably ate whatever was available. He also had a teenager’s nonchalance regarding unforeseen problems. When we arrived one evening to learn the hotel where we’d booked a room was oversold and the nearest vacancy was probably 70 miles away, he merely remarked that he would be equally comfortable driving another 70 miles or simply sleeping in the car. By day, I marveled at the breadth and scope of the landscapes we crossed. By night, we were too tired to marvel at much of anything. But late one evening in a nondescript interstate hotel, as I reached to turn out the light, I caught sight of something I hadn’t seen in a long time: my son, asleep. It felt like years since I’d watched him sleep. Teenagers tend to go to bed later than their parents do, and now most of the year he lives in a dorm hundreds of miles away. I paused for a moment, watching him, just as I had done so many times when he was a baby. Back then, I’d been filled with wonder at the existence of this tiny being. This time there was also wonder: that the once-tiny being I’d watched sleep was now a fully grown person, already one year through college and on the brink of an adult life in which I might have very little regular involvement. When children are young, the time we devote to them can seem endless – during a sleepless night of teething, for example, or on a rainy day at an indoor playspace. As they grow up, time together becomes increasingly rare as their attention turns to socializing, schoolwork, and pursuing their own interests. For the past year, long-distance video chatting about Tim’s college classes or internship has replaced much of what was once time together. So I treasured each mile of the trip. Hours spent on the interstate don’t make for particularly interesting anecdotes to retell back home, and we have very few photos to show for our days on the road. But I think I’ll remember well what it felt like to be crossing the country with my son at the wheel, the road unwinding in front of us, the cornfields surrounding us, and the kind of companionship we hadn’t had since his earliest years keeping us connected.